When the load outgrows the capacity of an existing transformer, it may be economical to install another one in parallel with it rather than replacing it with a single larger unit. Also, sometimes in a new installation, two units in parallel, though more expensive, may be preferred over a single unit for reasons of reliability half the load can be supplied with one unit out. Further, the cost of maintaining a spare is less with two units in parallel. However, when spare units are maintained at a central location to serve transformer installations in a certain region, single-unit installations would be preferred. It is, therefore, seen that parallel operation of the transformer is quite important and desirable under certain circumstances. (i) The transformers must be connected properly as far as their polarities are concerned so that the net voltage around the local loop is zero. A wrong polarity connection results in a dead short circuit. Three-phase transformers must have zero relative phase displacement on the secondary sides and must be connected in a proper phase sequence. Only the transformers of the same phase group can be paralleled. For example, Y/Y and Y/A transformers cannot be paralleled as their secondary voltages will have a phase difference of 30°. 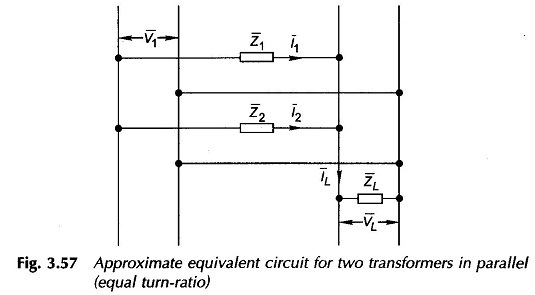 Transformers with +30° and —30° phase shift can, however, be paralleled by reversing the phase-sequence of one of them. The transformers must have the same voltage-ratio to avoid no-load circulat­ing current when transformers are in parallel on both primary and secondary Since the leakage impedance is low, even a small voltage difference can give rise to considerable no-load circulating current and extra /2R loss. There should exist only a limited disparity in the per-unit impedances (on their own bases) of the transformers. The currents carried by two transform­ers (also their kVA loadings) are proportional to their ratings if their ohmic impedances (or their pu impedances on a common base) are inversely propor­tional to their ratings or their per unit impedances on their own ratings are The ratio of equivalent leakage reactance to equivalent resistance should be the same for all the transformers. 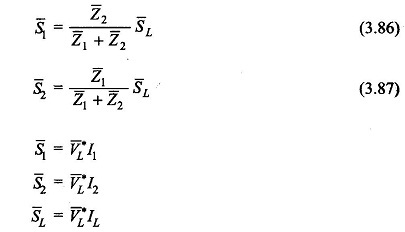 A difference in this ratio results in a divergence of the phase angle of the two currents, so that one transformer will be operating with a higher, and the other with a lower power factor than that of the total output; as a result, the given active load is not proportionally shared by them. The parallel operation of transformers can be easily conceived on a per phase basis. Figure 3.56 shows two transformers paralleled on both sides with proper polarities but on no-load. 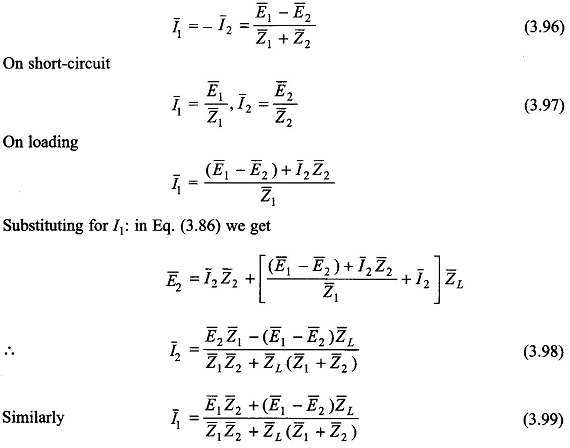 The primary voltages V1 and V2 are obviously equal. If the voltage-ratio of the two transformers are not identical, the secondary induced emf s, El and E2 though in phase will not be equal in magnitude and the difference (E1 — E2) will appear across the switch S. When secondaries are paralleled by closing the switch, a circulating current appears even though the secondaries are not supplying any load. The circulating current will depend upon the total leakage impedance of the two transformers and the difference in their voltage ratios. Only a small difference in the voltage-ratios can be tolerated. These are phasor relationships giving loadings in the magnitude and phase angle. 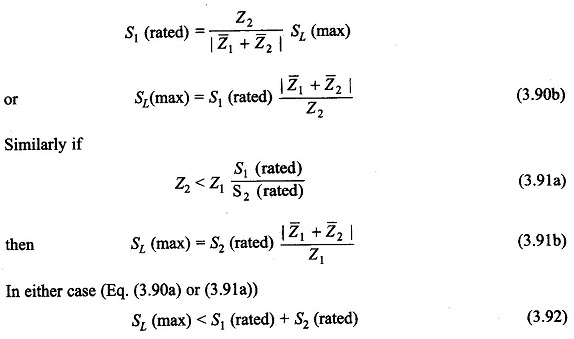 Equations (3.86) and (3.87) also hold for pu loads and leakage impedances if all are expressed with reference to a common base. It is seen from Eqs. (3.83) and (3.84) that the individual currents are inversely proportional to the respective leakage impedances. Thus, if the transformers are to divide the total load in proportion to their kVA ratings, it is necessary that the leakage impedances be inversely proportional to the respective kVA ratings, i.e.